The photographs in this section were taken whilst on holiday in 1989 and 1990. The photographic coverage of the line is not as comprehensive as I should have liked but I did as much as I was able given the constraints I was under at the time. I found the short electrified line absolutely fascinating and was fortunate that my first visit gave me the opportunity to photograph the earlier stock of classes 485 (4-VEC) & 486 (3-TIS). These were ex-London underground trains, built between 1924 and 1938 and rebuilt and adapted for the newly-electrified line from Ryde Pier Head to Shanklin, the sole remaining stump of a once quite extensive network. These EMUs lasted until 1990 when the newer, 1938-built class 483 trains were sent across. 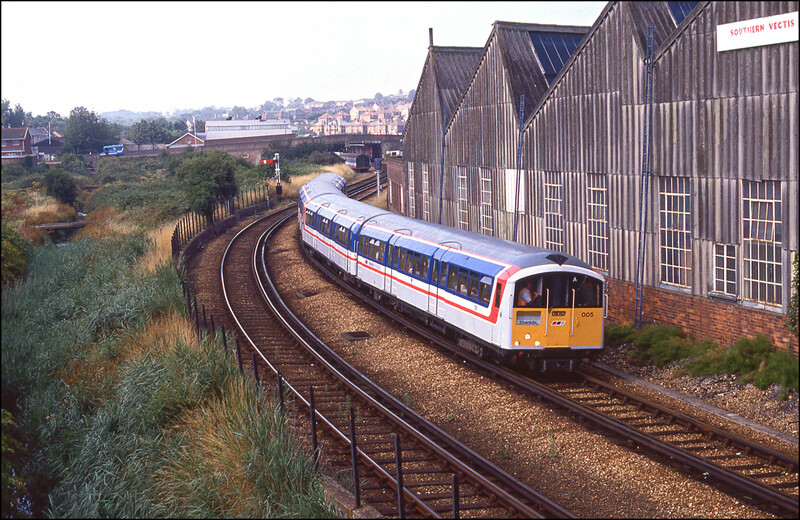 On my first visit in August 1989 the first of the new stock had arrived and was to be seen in the yard at Ryde St Johns Road. The EMUs were, of course, not the only items of interest on the island. 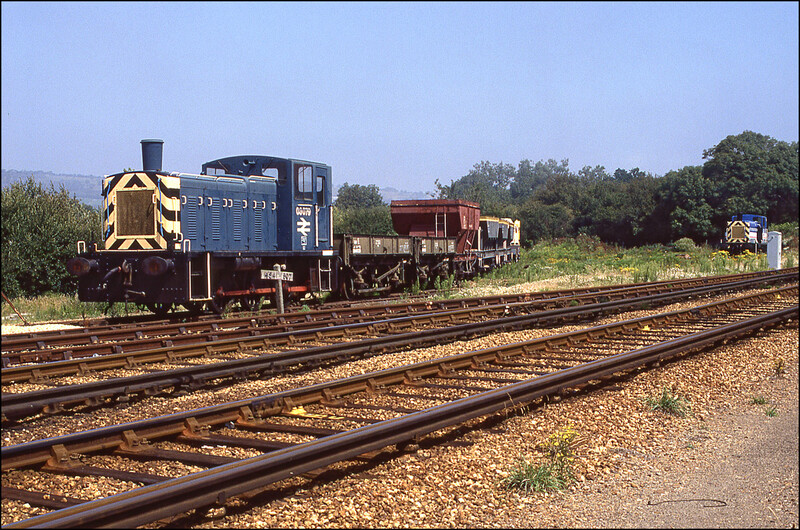 There were also 2 class 03 diesel-mechanical locomotives together with a small collection of permanent way wagons. These were used almost exclusively in the winter months and each covered only a handful of miles each year. I hope that these relatively few pictures will give a taste of the Vectis line at this transitional time. The liveries carried by the trains has changed since my last visit and I trust that it will not be too long before I cross the Solent again to update my collection. The photographs are roughly in geographical order from Shanklin to Ryde and back again, the outward journey being the older pictures. Because of the frequency of the service and the thoroughly predictable nature of the traffic I do not have any details other than the times at which I took the pictures. 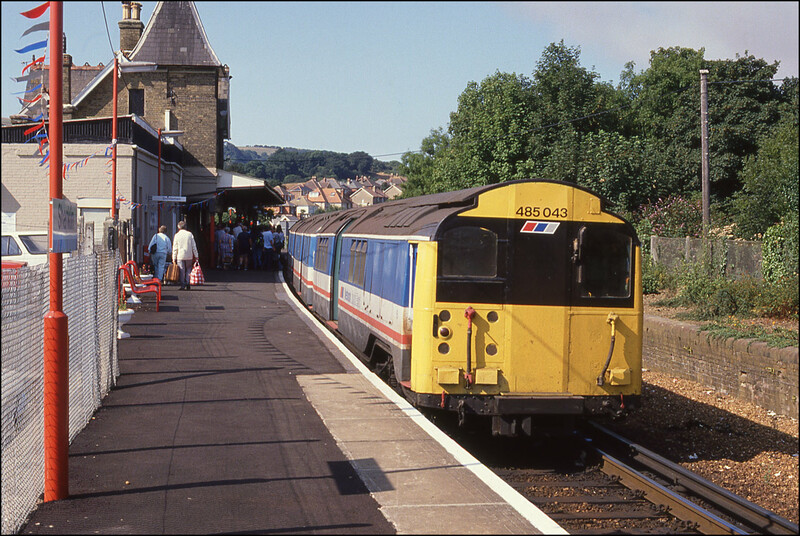 The first picture, taken at 10.10 shows unit 485043 standing at Shanklin on 9 August 1989 having just arrived from Ryde and disgorged a goodly load of passengers. The line was well-used while I was there for this week and seemed popular both with locals and tourists. Shanklin is now the terminus of the line and bearing in mind the amount of development that has taken place over the former trackbed, reinstatement beyond this point is impossible. The only semaphore signals remaining on the line were those to be found around Ryde St Johns Road, where the shed and workshops are situated. 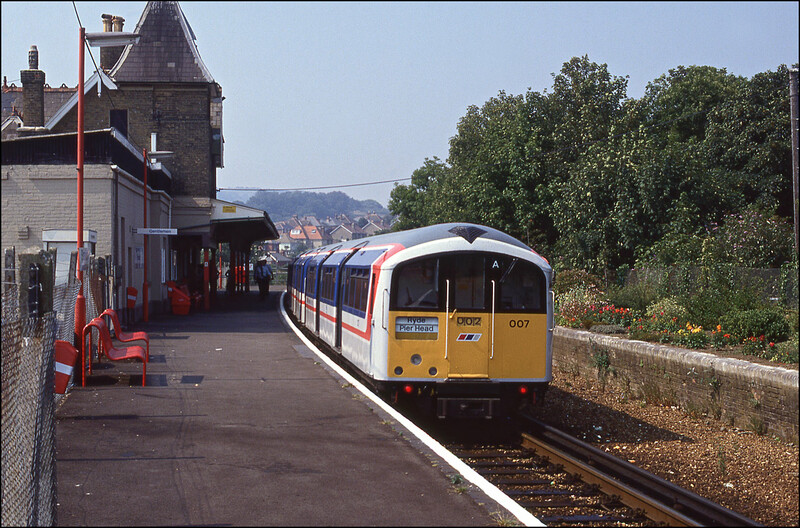 This is the standard but nonetheless attractive shot of a train, 485044, arriving at the station from Shanklin at 10.53 on 9 August 1989. A sister unit had just passed in the opposite direction and the platform-end starter has not yet been returned to danger. Unit 485045 stands in the bay platform at Ryde St Johns Road at 16.59 on 9 August 1989. 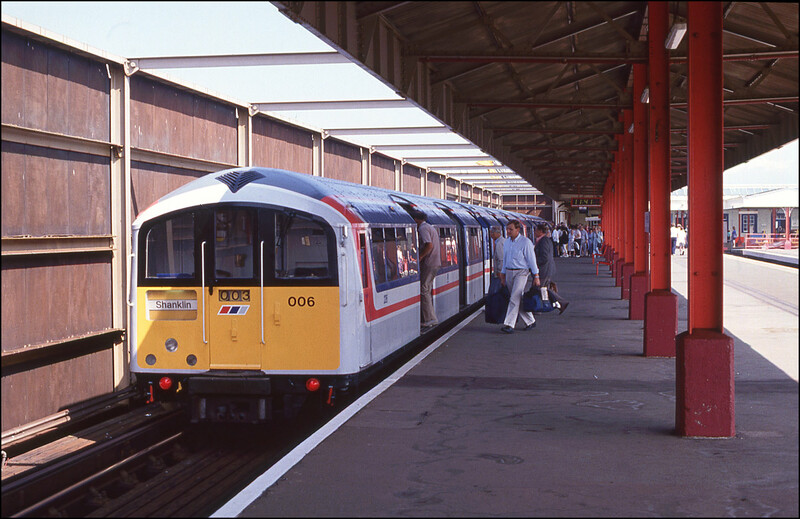 The graphic representation of the Isle of Wight is clearly visible on the front of the train. Note also the attractive ironwork forming part of the platform canopy. 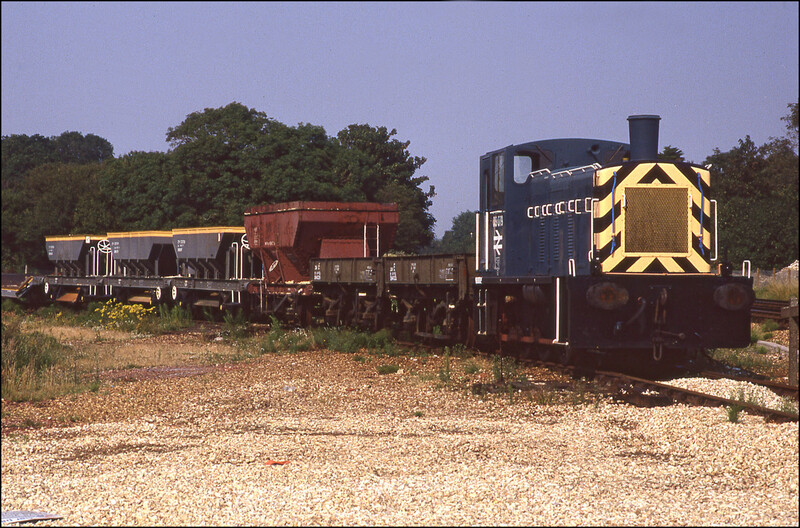 A sign of things to come was present in the yard at Ryde St Johns Road at 16.56 on 11 August 1989. Unit 001, the first of the refurbished 1938 units had already arrived. These "new" trains would soon take over from the older and arguably more character-filled units. 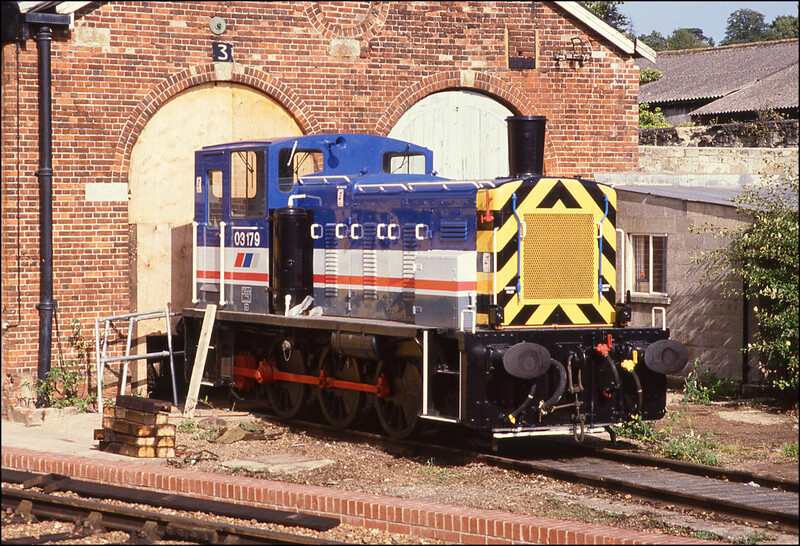 Standing close to the unit pictured in the shot above was one of 2 class 03 diesel shunters. This one, 03179, was adorned in Network South East colours, to reflect its ownership. It was officially allocated to Eastleigh, but did not, of course, ever go home. This loco, and sister 03079, did not see a great deal of use and was mostly employed on overnight trains in the winter. This is my only shot of a class 486 unit. 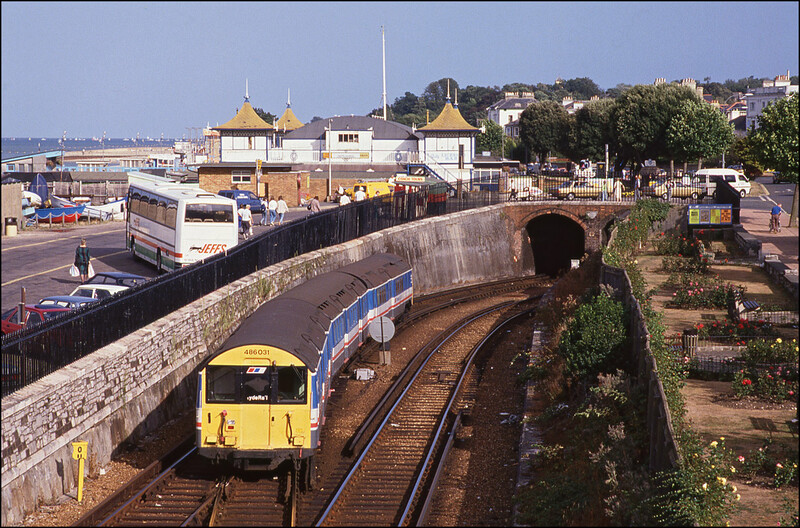 It shows 486031 leaving Ryde Esplanade station at 17.25 on 11 August 1989, crossing over onto the up line and about to enter the short tunnel en-route to Shanklin. Most off-peak trains terminated at the Esplanade station other than when a ferry was due, when they ran to the end of the pier. Turning around from the picture above, this is the view of a 6 car train headed by 485043 leaving Esplanade Station at 17.10 on 11 August 1989. 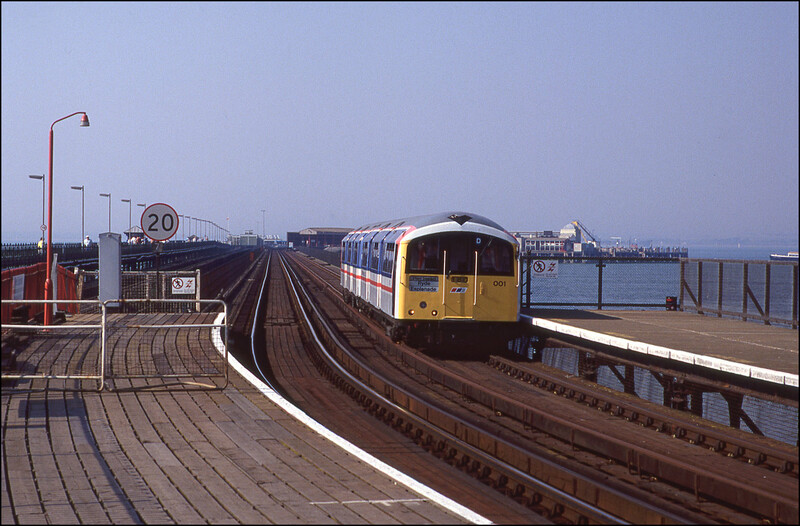 This too was a service that had terminated here rather than ran on over the pier. 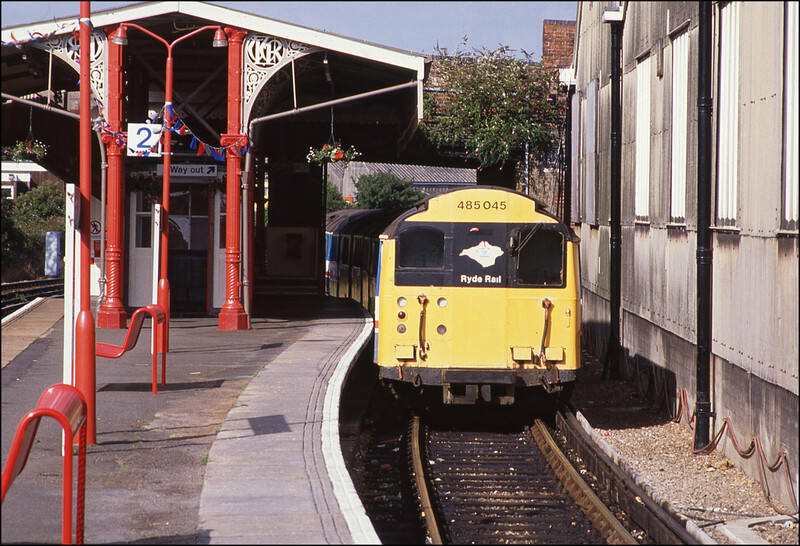 This is unit 485041 standing in Ryde Esplanade station at 17.34 on 11 August 1989. The nearside pair of tracks was used only by peak hour trains when a ferry had arrived at the pier head. 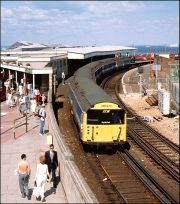 This train had terminated after arrival from Shanklin and was about to head back from whence it had came. 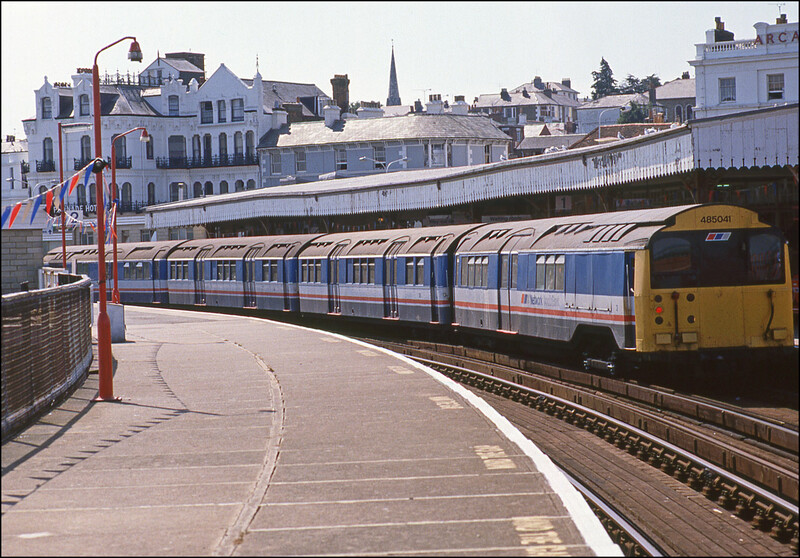 By the time I next visited the Isle of Wight the class 485s and 486s were no longer in service. 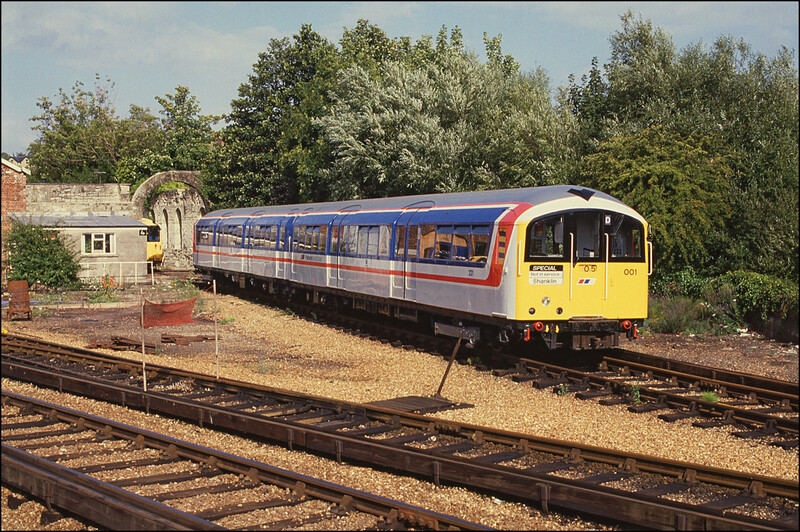 The 1983-built class 483 units which were rebuilt in 1989 were in charge of all services. Here is a picture of 006 couple to 005 standing in the Pier Head station at 09.45 on 31 July 1990 waiting for the next ferryload of passengers to board. These services were very busy, particularly at weekends when the holiday changeover took place. If one arrived at the Island on foot by ferry there was no alternative, other than walking along pier, to reach Ryde. 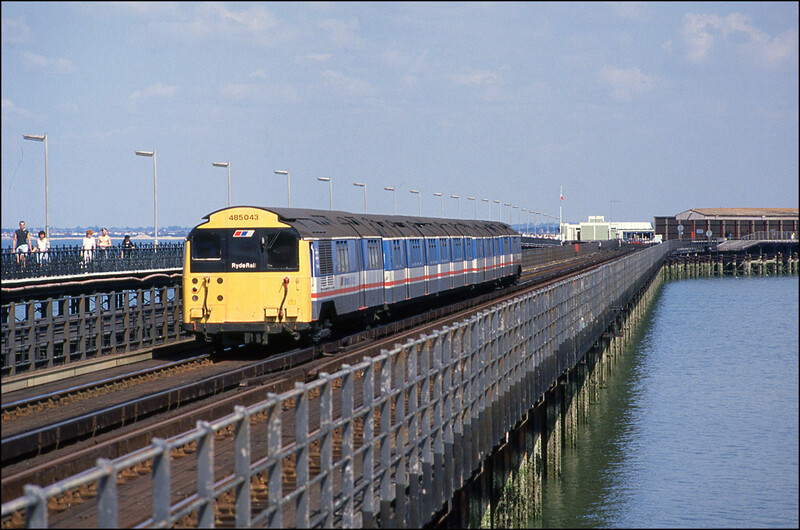 The next picture shows unit 008 crossing the pier at 11.04 on 31 July 1990 and heading for Ryde Esplanade station. To the left of the train can seen the tramway, by this time out of use for many years. The afternoon version of the picture shown above was taken at 16.50 on 2 August 1990. It depicts 001 on the shuttle from the Pier Head station to Ryde Esplanade. 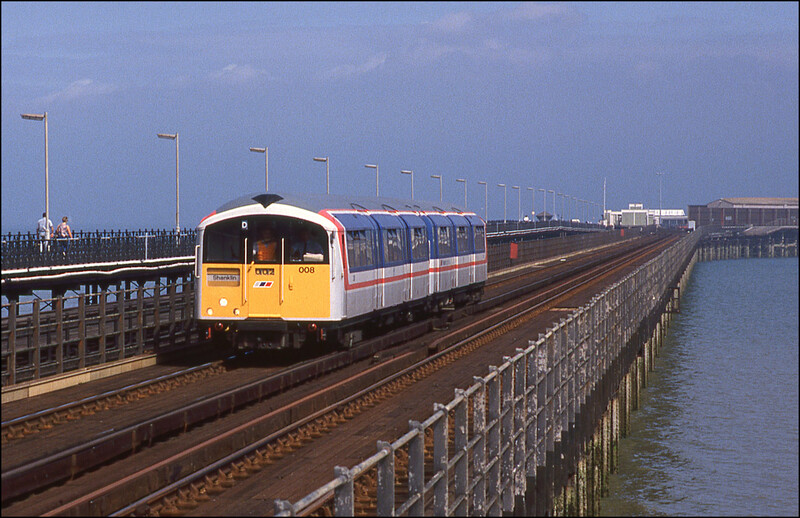 This set of tracks was generally used only at peak times so I was pleased to get a shot of the shuttle approaching Ryde in good light. 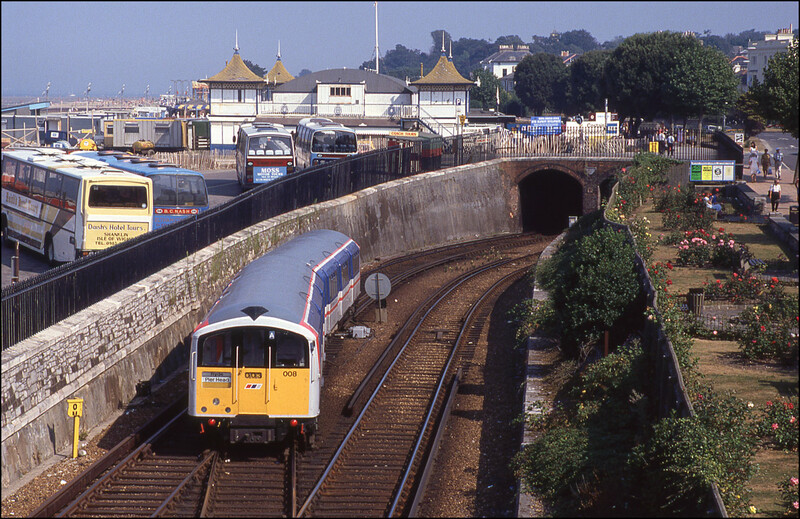 I particularly like this shot of unit 008 leaving Ryde Esplanade station and about to enter the short tunnel under the road, as it gives a good impression of the diminutive size of the trains compared to the large coaches to the left of the photograph. The shot was taken at 16.15 on 2 August 1990. The location for this photograph is a road bridge alongside the Southern Vectis bus garage near to Ryde St Johns Road station. 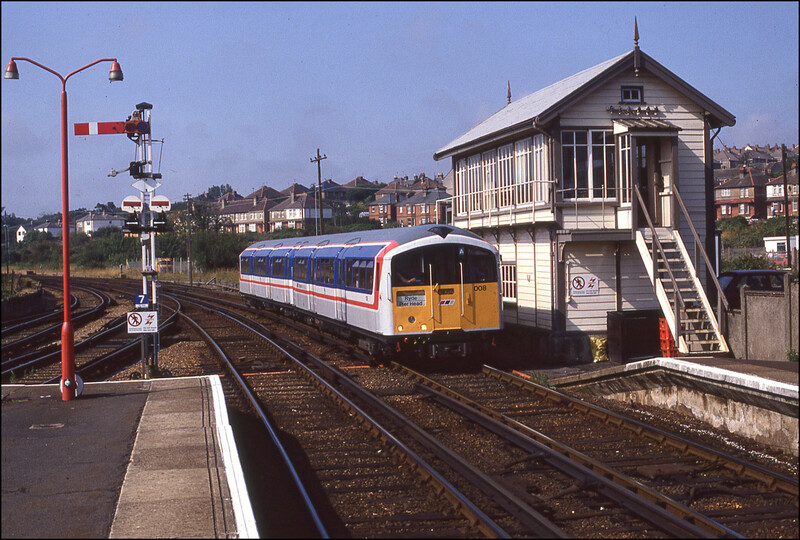 It shows units 005+006 en-route to the Ryde Esplanade passing both semaphore and double aspect electric signals at 10.34 on 31 July 1990. Just visible in the background is a class 485 carriage in a siding alongside the depot adjacent to the station. The electrified line from Ryde to Shanklin is not, of course, the only line on the Isle Of Wight. 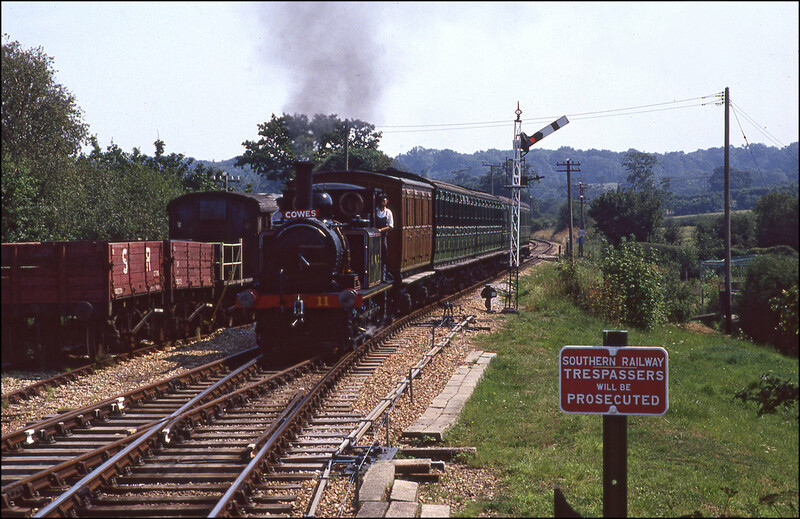 The Isle of Wight Steam Railway also operates a regular service using various preserved locomotives and some lovely vintage stock. I am not a great fan of photographing on this sort of line, but do enjoy having a ride on them. 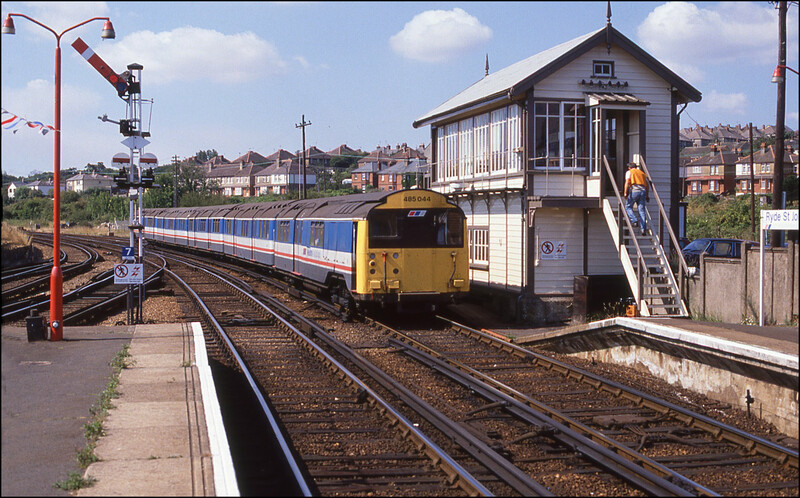 On 2 August 1990, my then girlfriend and I had a trip from Haven Street to Wootton, went for lunch nearby and then waited for the next train back. I took this picture of IOW No. 11 approaching Wootton with its train at 14.00. Sadly, the destination board on the smokebox bracket is unlikely ever to be factual. I have already shown a picture of 03179 in this section and to complete the Isle of Wight locomotives here is 03079 standing with a rake of permanent way stock in Sandown yard at 09.00 on 31 July 1990. This shot was taken from a building site adjacent to Sandown station which was deserted at the time so I just walked up the fence and took this shot which also shows 03179 in the background. 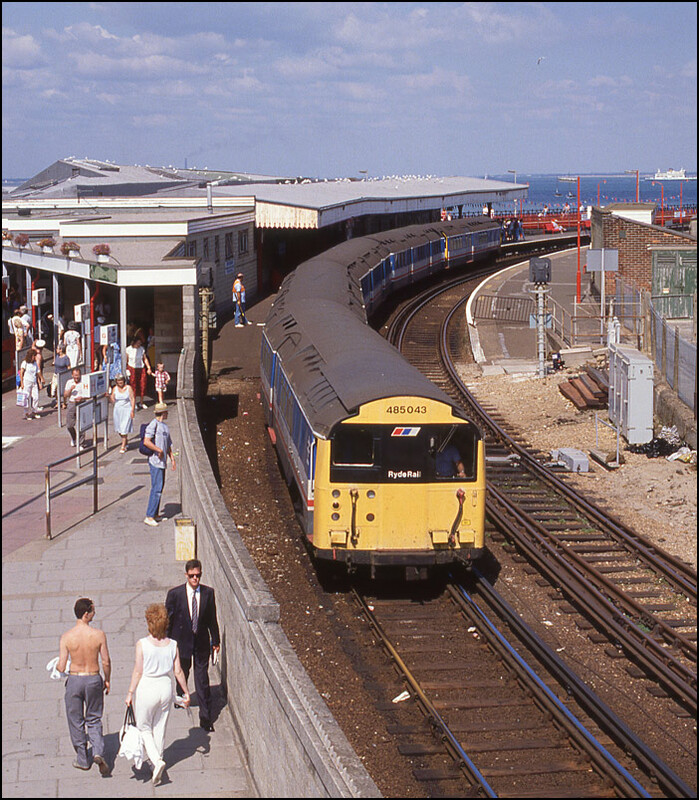 I so liked the look of the scene in Sandown yard that I returned during the afternoon of 2 August 1990 to have another shot or two. There was a track circuit problem on the main line this afternoon meaning that trains were under the control of a staff member using a telephone to contact the signalbox at Ryde St Johns Road. I asked permission to enter the yard to take my photographs and the very friendly chap said that was very welcome to do whatever I wanted, but why on earth would anyone want to take photos of that old thing? !